Invite Mark Edward Geyer for a school visit and bring the world of book illustration right into the classroom. The role of an illustrator in the making of a book. How an illustrator works with the editor, the author, and the art director. The importance of research, especially when illustrating “period” novels that take place a long time ago. How illustrators and authors utilize and draw upon their educational background. How illustrating fiction differs from illustrating non-fiction: how illustrating The Inquisitor Apprentice series and The Shakespeare Mysteries differs from illustrating Who Was Ulysses S. Grant? How an illustrator "stages" the characters in an illustration. Learning to rely on instinct. 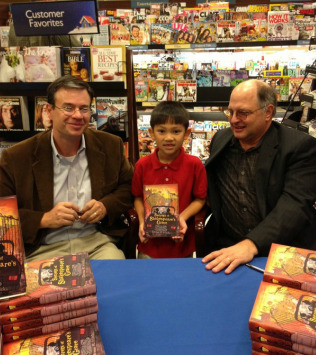 Here I am (on the right) with author Deron R. Hicks at a Barnes and Noble ​book signing after a day spent with students of Brookstone School in Columbus, Georgia. Or, you can also email the Children's Publicity Department, childrens_publicity@hmhpub.com, or send a fax to 617.351.1111. Honorarium Fees: Please contact me by email for these costs: markedwardgeyer@hotmail.com Fees do not include travel and expenses, which are also the responsibility of the school.